How much does the average funeral cost? In most cases, funeral costs are comprised of a variety of charges and fees, depending on the location and type of funeral service selected. Personal preferences also play a role. According to recent data from the National Funeral Directors Association (NFDA), the national median cost of an adult funeral with viewing and burial is $7,360. Keep in mind that this is just an average: Some families will pay more or less, depending on the factors mentioned above. To get an idea of the typical American funeral and burial service, here’s a simple breakdown that explains average funeral prices. Additional options and products catering to personal choices and/or cultural traditions. Funeral homes may also charge cash advances for any merchandise purchased for you from other vendors, such as obituary notices, flower arrangements, clergy fees, musicians, and cemetery costs. The funeral director is expected to tell the family how much these services cost before making the advance purchase, and they must also pass on any discounts or rebates on cash advance items provided by the third party seller. The basic general services provided by the funeral director are non-declinable. They include filing the death certificate, procuring permits and licenses, arranging the funeral service, ensuring safe handling of remains during transportation, and general overhead expenses. The cost for funeral director services averages about $2,100. The costs involved in transferring the deceased from place of death to the funeral home average around $325. Embalming is not a legal requirement if the body is immediately buried or cremated. It is, however, strongly recommended for a viewing/visitation service. Embalming is required in certain cases, like if the deceased is transported between states or countries or if there is a long period of time between death and burial. It may cost around $725 for the embalming process. These services include washing the body, clothing, doing makeup, and styling hair. Preparing the body is a respectful process that requires a professional touch. Families are welcome to provide clothing, jewelry, and other small mementos to place in the casket with the deceased. The average price for body preparation is $250. Depending on the type of funeral service – and if a viewing is planned – these costs cover rental charges for the funeral venue, as well as staffing expenses. Other fees are associated with holding the funeral service, like audio-visual equipment rental, parking assistance, and more. Costs average at just over $900. Funeral transportation charges cover the use of a hearse, limousine, and/or other service vehicle which transports the body. There may also be an additional fee for a funeral procession, based on the distance between funeral venues, the overall number of participants, and whether security is required. Average expenses are just under $500. Printing funeral service programs, memorial cards, and keepsakes (such as bookmarks or photos) are usually part of the funeral printing package expenses, averaging $160. You can purchase a casket from a funeral home showroom, an outside vendor, or even online. Funeral homes must adhere to the Funeral Rule, which gives families the right to get a written casket price list before viewing the actual caskets. This gives the bereaved a better idea of how much they can expect to pay. Caskets are easily customizable, and come in a variety of materials. The most common choice is a combination of wood and metal. As with all commodities, casket prices can vary dramatically. For example, a simple pine box will cost far less than a top-of-the-line bronze model. That said, the average price of a casket is $2,400. What Are The Costs of Burial? If a graveside ceremony is planned for after the funeral service, another set of burial expenses will be incurred. For a burial that takes place in a cemetery, the family is expected to pay for the grave plot beforehand. The cost of a burial plot depends on the type of plot, as well as the location. Most cemeteries provide single-space graves for one person, and double-space plots where two people can be buried in the same grave. Companion plots are also available for those who prefer to be buried side by side, and mausoleums allow for the above-ground burial of individuals or families. Grave plots in rural cemeteries are often cheaper than plots in cemeteries near large cities (where space is at a premium). As such, burial plots can cost anywhere from $200 to $20,000. It’s also important to note that purchasing a plot does not mean you own the land. Instead, you are buying burial rights which give you the right to use the land for the exclusive purpose of burying your loved one(s). This is subject to cemetery rules and regulations. Some families choose to have a home burial on private land. In this case, local zoning regulations must be followed and all necessary licenses and permits need to be acquired before interment. Because the casket declines over time, cemeteries often require a burial vault or grave liner to prevent the casket from sinking further into the ground. Grave liners cost less than burial vaults, as they cover only the top and sides of the casket. A burial vault surrounds the casket and is often made of reinforced concrete or metal. As of 2017, the median cost of a burial vault was $1,395. Interment fees are incurred for opening and closing the grave. This process usually involves the use of a backhoe to dig and shape the gravesite, according to specified dimensions. Interment fees can range anywhere from $300 to $1,500. Headstones and grave markers come in an assortment of shapes, sizes, designs, and colors. Materials used to construct these gravestones can include granite, bronze, marble, limestone, and various other mediums. Inscriptions – and even images – are engraved or etched on the headstone in different styles and finishes. Grave markers lie flat on the ground, while headstones and monuments can be positioned upright or slanted. Installation costs are usually included in the overall price, which can run from $1,000 to more than $10,000. Perpetual care fees are charged by cemeteries to cover continued maintenance costs for the burial ground. These can include tasks such as landscaping and mowing, security, and general upkeep. Costs vary based on size and location. Paying for a funeral can be overwhelming, especially when decisions need to be made quickly during a stressful time. Remember that the total funeral cost ultimately depends on the type of goods and services chosen for a loved one, or the funeral options selected when pre-planning your own funeral. A traditional funeral service with burial may cost more than a memorial ceremony, but each service can be arranged and personalized according to budgetary constraints while providing an opportunity for loved ones to gather in honor of the deceased. Talk with your funeral director about payment options that help cover some of the funeral costs. Funeral professionals can also explain how to use life insurance policies or burial insurance to pay burial costs, and provide information on financial and social assistance programs available to families in need. 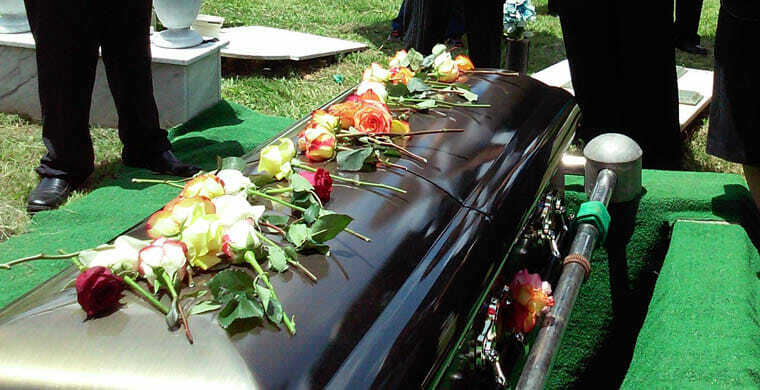 To find funeral homes and compare funeral costs in your area, visit Funeralocity.com today.